Back in 2014, the region’s mayors agreed on a 10-year vision for transportation focused on expanding high-quality public transit, enhancing walking and cycling infrastructure, and maintaining our regional road network. Currently, phase 1 of the vision is funded and is being implemented. TransLink has setup an interactive map where you can view the status of all projects and expanded services that have been built, implemented, or are underway. At the end of March, an agreement was reached to fund phase 2 of the vision. The two big items in phase two are extending the Millennium Line to Arbutus at Broadway in Vancouver, and building light rail in Surrey. As part of the process, TransLink conducted a series of public consultations both online and in-person during the first half of this month. Around 2,700 people completed an online survey, and around 900 people participated in-person. TransLink also commissioned a scientific survey of 2,000 Metro Vancouver residents. These residents were asked how important they felt the major components of phase 2 of the vision were for the region. The follow chart shows the summary of what people who participated in the survey thought. Reponses to question: How important do you feel each of these planned transportation improvements is for the Metro Vancouver region? Select chart to enlarge. The bus system is the backbone of the transit network in our region; the majority of transit trips are by bus. It was interesting to see that people placed a higher importance on expanding current service on the bus network and the SkyTrain network, over building new rail lines. In all cases, no more than 25% of participants thought that the phase two projects where not important. 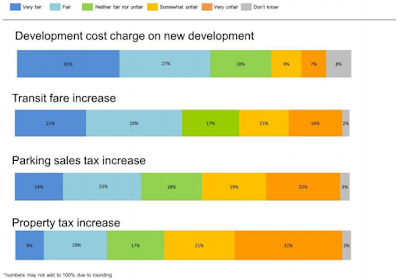 When asked about the fairness of how phase two will be paid for, the majority of survey participant thought that the proposed funding sources were reasonably fair. The exception was property tax where 53% of people thought it was unfair. Responses to questions Do you feel that these are fair or unfair ways of paying for the region’s portion of these transportation improvements? Select chart to enlarge. With phase one and phase two moving forward, all that remains is getting funding sorted out to pay for the final phase of the vision which includes building light rail to Downtown Langley. I am hopeful that this funding will get secured before the next federal election. A couple of comments -- it's mildly disturbing that 'road improvement' is still seen as the #1 priority -- an indication of the auto-centric nature of our region, and that the Surrey Line is so far down the list. 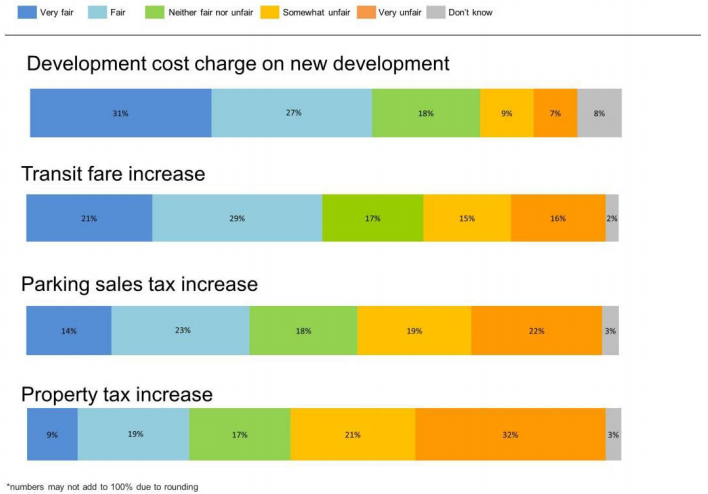 Also, that the Development Cost Charges are seen as the 'fairest' way to pay for transportation expansion, while property taxes are way down the list. Basically: "new home owners, you pay -- we who already own homes, we shouldn't have to pay more"; this despite the fact that we all benefit from improved transportation, not just new homeowners.